GCU was founded in 1949 and was originally located in Prescott. Two years after their opening they relocated to Phoenix and began to build a strong reputation as a premier, private Christian college. The University’s purpose it to make a difference in the lives of others by offering bachelor's, master's and doctoral degrees in fast-emerging fields. Their campus infrastructure is rapidly expanding and brand new amenities include state of the art athletic facilities. The NCAA recently informed Grand Canyon University that it has been granted Division I active membership. Prior to their active status as a Division 1 member, the Antelopes were on a four-year probation period to officially become an NCAA Division I school for its sports teams. 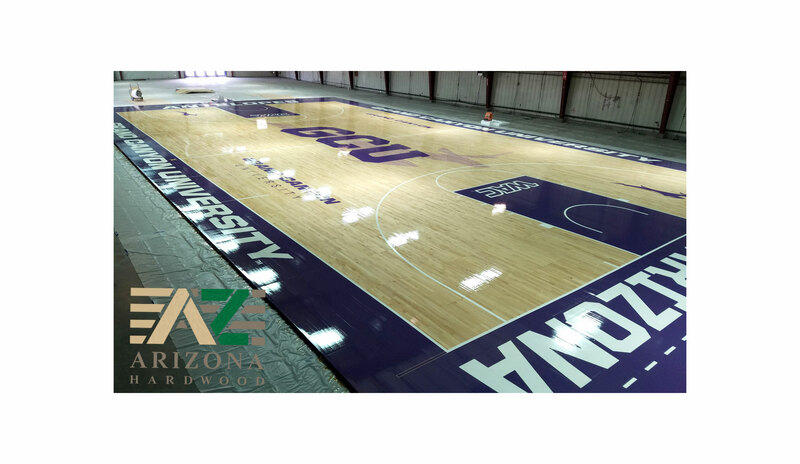 Arizona Hardwood Floor Supply was called to update the artwork on their basketball court to reflect their Division 1 status. No stranger to sports wood flooring systems, in January of 2016, LGE Design/Build contacted us to help specify and build a sports wood flooring system that would work for a new field house called the Victorium Sports Complex that was built in North Scottsdale. During the project we use professional grade Bona paints and finishes to complete the project. Founded in 1919, Bona is a family owned company with its headquarters in Sweden and is now present in more than 100 different countries. A worldwide industry leader in hardwood floor care, Bona is committed to sustainable solutions. Their products are safe for floors, families and the environment which is one of the many reasons why Bona is our trusted source for their high quality products. At Arizona Hardwood Floor Supply we continually strive to stock the highest quality solid, engineered hardwood and laminate flooring, installation and professional refinishing products, selected for quality, beauty and durability. For more information on the hardwood flooring installation and products we provide, please click here to contact us or call (623) 742-9663 (WOOD) or stop by one of our convenient Valley locations. Website Design for Contractors by BANG!